A 16-year old girl, identified as Victory has been shown the dark and horrible side of social media after she was reportedly kidnapped by a so called Facebook lover in Edo State, while the abductor demanded N4m for her release. In a report by PM News, the 24-year old kidnap suspect, Michael Duda, was paraded in Benin, by the Edo State Police Command on Thursday, alongside 104 suspects arrested for various crimes, ranging from kidnapping, r*pe, armed robbery and cultism at the headquarters of the Edo Police Command. Micheal, an OND graduate of Business Administration from the Federal Polytechnic Auchi, said he got to know Victory whom he met on Facebook, after she accepted his friend’s request. He said as their friendship grew stronger, he decided to invite her to his house which she accepted. He however denied that he abducted her against her wish, adding that both of them planned her kidnap to raise money. The teenage kidnap victim who admitted that they became friend through Facebook, said Micheal invited her to come to his house, which she obliged. She said getting there, Michael abducted her and kept her for four days, sexually assaulted her and also demanded for N4 million for her release. “On Thursday, at Ebike village, Ogheghe, bypass, Benin City, Michael, deceived me by inviting me to his house and when I got there, he told me we should plan kidnapping so that I should stay in his house. “I met Michael on Facebook last month through a friend request he sent me which I accepted. “I spent four days in his house. He made a call to my father and asked him to pay the sum of N4 million into his own account. He forced me into sleeping with him,” she narrated. “I live at Ekae community, off Sapele road. She came to my house. We planned to collect money from her father to raise money for our marriage but I did not collect the money again. She stayed in my house for four days. Elder sister of Victory, who gave her name as Rodha, said her sister was sexually abused before the police rescued her. On the alleged plans by the two lovebirds to get married, she said: “My sister is 16 years old and has never slept outside before. She told me they met on Facebook and the boy professed love for her. When she went to the house, she said the boy hatched the plan and said he would collect N10,000 from our father but the boy demanded for N4 million. “He will lock her inside the house and called us, threatening that he will kill her if we did not pay. He took advantage of my sister’s condition. 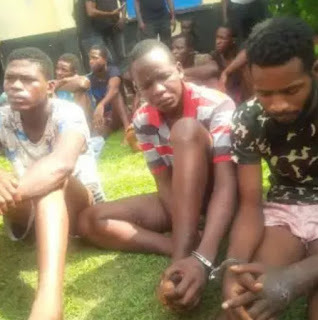 The State Commissioner of Police, Johnson Babatunde Kokumo, who paraded the suspects to journalists, called on the members of the public to furnish the police with useful information that could lead to the arrest of all criminal elements in the state. He said the command is ever ready to partner relevant bodies in the state to get rid of crimes and criminality in the state, adding that the suspects would soon be charged to court.